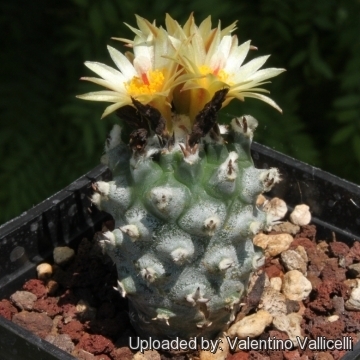 This is a very distinctive short spined variant of the famous Turbinicarpus flaviflorus. 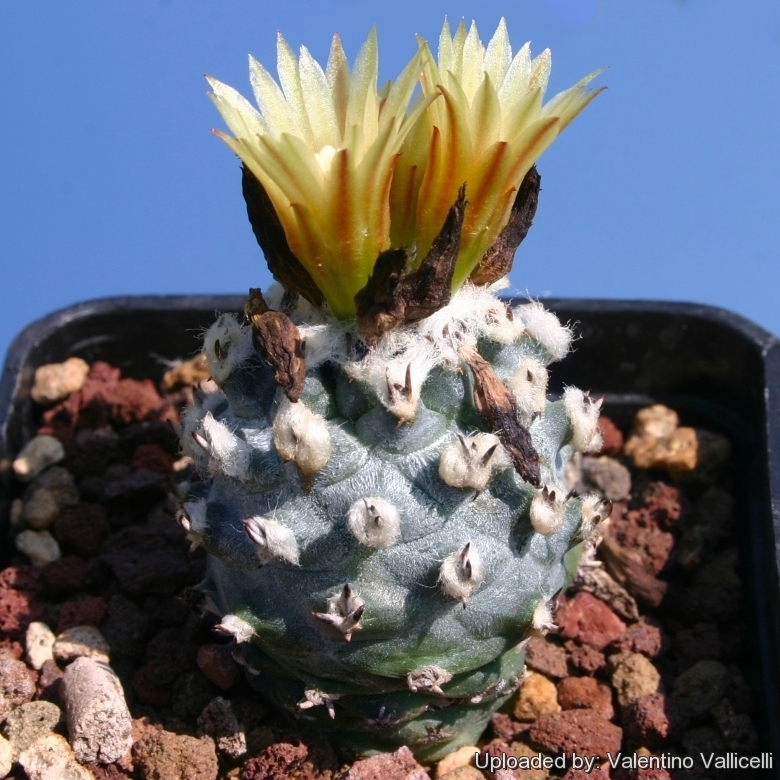 This variety has very short corky golden-brown spines that contrast well with the body which is coated in a whitish bloom. 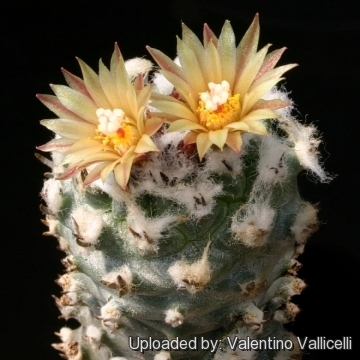 Description: Cylindrical grey-greenish and coated in a whitish bloom 2.5 cm in diameter, 5 cm tall. Tubercles: Conical with a rhomboidal base, Slowly clumping. Areoles: Small with white caduceus wool. 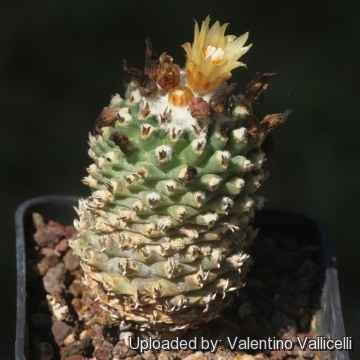 Spines: 4 spongy, chubby and very short, 2-4 mm long yellow-brownish. Flowers: Infundibuliform, light yellow-green up 1,5 cm in diameter. Blooming season: The flowers appear at the plants apex in succession from spring to summer. Fruit: Longly ovoidal 10 mm long. With dried flowers remnants. 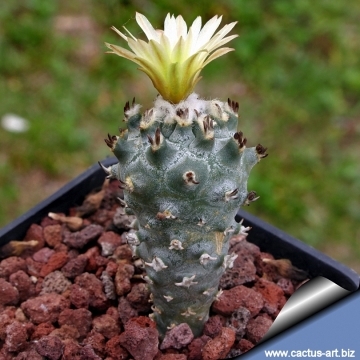 Cultivation and Propagation: It’s a fairly easy and robust species to cultivate, but very slow growing. 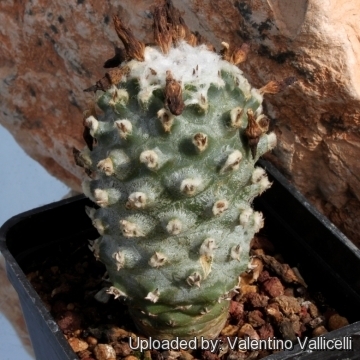 It needs a very well-drained soil, and requires strong sun to part sun to keep the plant compact and low. Waterings should be rather infrequent to keep the plant compact, and avoid its becoming excessively elongated and unnatural in appearance. 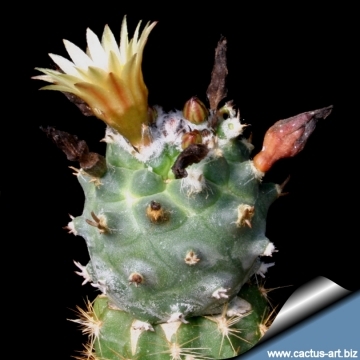 Furthermore it has a tap root, and watering it properly is often difficult, because it tends to crack open or rot if over-watered. Keep dry in winter, or when night temperatures remain below 10° C. It is hardy to -4°C for a short period. Assure a good ventilation. 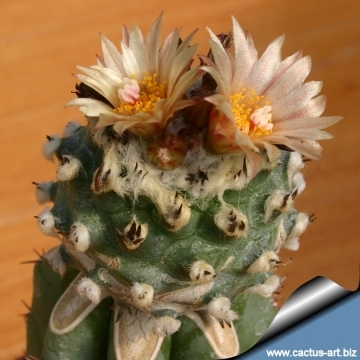 Reproduction: Cutting or grafting or by seeds (if available).